The Rookery, completed in 1888, was designed and constructed by the eminent Chicago Firm of Burnham & Root. The public spaces of the interior were remodeled by Frank Lloyd Wright in 1905. 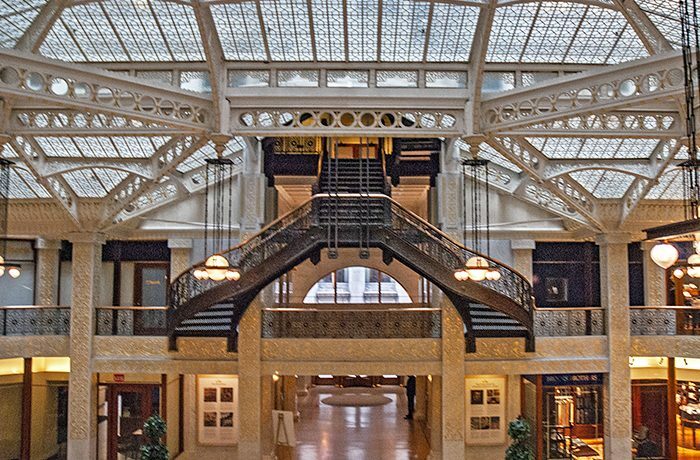 The Rookery is both a National Historic Landmark and a Chicago Historic Landmark. HPZS's Comprehensive Restoration Plan included the entirety of the exterior including the terra cotta cornice, as well as all historically significant lobbies, light court, entrance and stairways, preserving marble work, iron and bronze castings, cast iron restoration and glazing and glass block restoration throughout the building. HPZS was awarded a National Honor Award and Interior Honor Award by AIA, and an Interiors Honor Award by AIA Chicago for their detailed and beautiful execution of this preservation project.